Now Available on iTunes, Google Play, Amazon Music or your favorite e-tailer! Click here to listen and download your copy today! 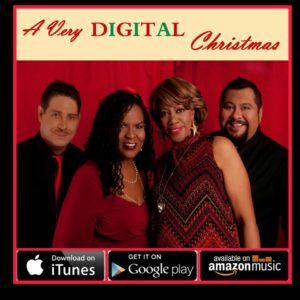 “A Very Digital Christmas” is now available worldwide at your favorite online music store! Long Beach, CA (Nov. 1, 2017) Synth-pop group Digital Soldiers unveiled their first Christmas album featuring an eclectic mix of Pop and Electronic Dance Music (EDM) and three original holiday tunes penned by the group. Recorded in West Hollywood, Long Beach, CA and Chicago, “A VERY DIGITAL CHRISTMAS” features collaborations with Yazoo tribute band SITUATION and members of Crush 333. Digital Soldiers formed in 1994 when Marss Ramos and Mark “Iowa” Ortega met through a mutual friend. Their musical passion was instant as they loved Erasure, Pet Shop Boys and EDM. Paula Flowers was soon added for her soulful diva vocals. Lorie “Madeve” Madison came into the group in the early 2000’s to top off an already dynamic band. The final original, “Santa Bring My Love Home,” was the first song that Lorie Madison, Ramos and Ortega collaborated on together. Set to a 60’s feel, the original song highlights Madison’s affinity for Diana Ross. Digital Soldiers have performed throughout Southern California including LGBTQ events at Palm Springs Pride, San Francisco Pride, L.A. Pride and were honored to be the last local band before The Motels, Berlin and Taylor Dayne appeared at Long Beach Gay Pride in 2003. Members have also performed in Phoenix, Las Vegas, Austin and Chicago.